Russia knows its enemies will try to take advantage of Moscow’s preoccupation with the World Cup. While the world community of nations is captivated by the soccer competition, global attention can be easily hijacked for nefarious purposes. The MOSSAD, especially, is well-known for staging highly dramatic terrorist attacks during international events like the Olympics. Therefore, the Syrian people need to be extremely vigilant. Communities near U.S. military-occupied areas are particularly vulnerable throughout the duration of the World Cup. The Western powers aligned against the Russia Federation have demonstrated time and again that they will rain on Russia’s parade (read: World Cup in the present case) whenever the opportunity presents. All of the nations that make up the Anglo-American Axis (AAA) hate that Russia is hosting this premier global soccer event. Great Britain, in particular, has gone to great lengths to spoil the 2018 World Cup. See: Did the British Secret Services poison former Russian spy to blame Putin so they could boycott the World Cup? Through their various intel proxies and undercover media agents, these same countries have been making threats about terrorist attacks conducted at the Russian contest venues. They have even warned their citizens not to travel to Moscow because of the danger involved. The mainstream media (MSM) has disseminated so much fake news about a potential terror event that they must be planning one—false flag operations that only the Western powers could practically carry out. While President Vladimir Putin was celebrating the success of the 2014 Winter Games in Sochi, Russia, the United States and United Kingdom were busy executing a coup d’état in Kiev, Ukraine. These two countries successfully took advantage of Putin’s distraction and ousted the Ukrainian president in short order. Not only did they forever mar those Olympic games, the “Empire” showed that they will perpetrate any act of terrorism or war during international events. Now let’s fast forward to 2018. The Western mainstream media (MSM) has issued a slew of veiled threats and warnings to Russia. Because so many of these juvenile bluffs turn out to be “the boy crying wolf”, it makes it very difficult for the Kremlin to discern when a terror risk might be authentic. This is how they seek to wear down Putin’s security and intelligence agencies, especially during the World Cup. The real problem with this unfolding scenario is that it forces Russia to pay close attention to other hotspots around the globe. Not only is the Ukraine always festering and a moment away from armed conflict, Syria is the #1 target for the NWO globalist cabal. 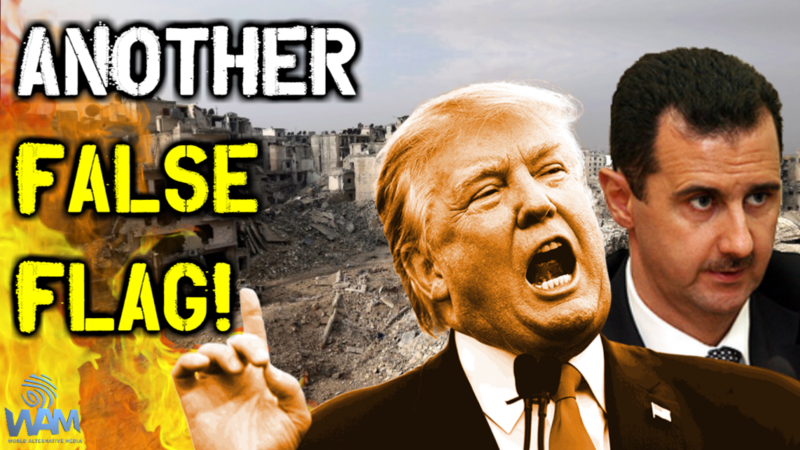 The warmongering Neocon Zionists in the U.S. and U.K. who started the Syrian War will not rest until they reverse the gains made by Syrian President Bashar al-Assad. The CIA, MI6, DGSE and MOSSAD are always looking to create opportunities to commit atrocious war crimes which can then be blamed on the Assad’s government and/or military. Agents from Saudi Arabia and Turkey are likewise deeply embedded in these black operations designed to turn world opinion against Damascus. Because of this very tenuous state of affairs, Russia has already put out a serious SOS about the Western militaries and intel agencies colluding with terrorists on the ground in Syria. Their primary goal is to pull off yet another chemical attack that can be plausibly blamed on the government forces. 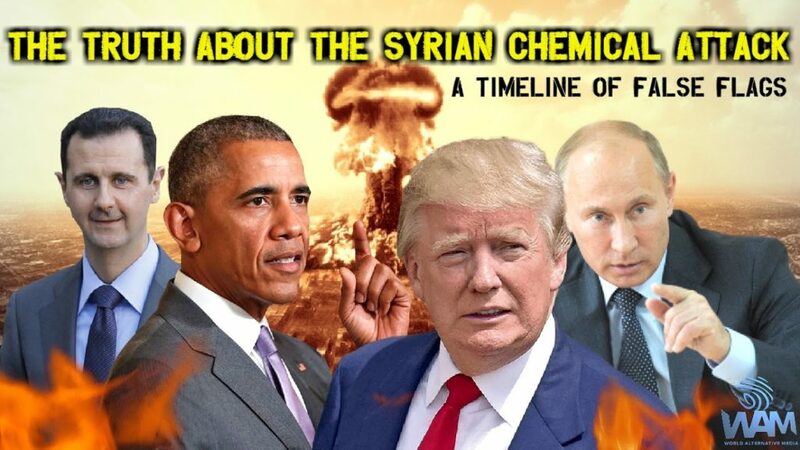 They have tried this deceit on numerous occasions, twice with enough success that President Donald Trump reacted with unlawful airstrikes against the sovereign nation of Syria. The criminally insane psychopaths who are staging these false flag attacks do not care a whit about how well these unrelenting black ops are implemented. They don’t even seem to care how they are perceived at the United Nations or any other major international venue. All they are determined to do is fabricate enough immediate anger against Russia and Syria and Iran so that the U.S. coalition can justify a military response. Of course, such an act of naked aggression, especially when it lacks any legal basis or evidence of a war crime, only further destroys the rule of law. The reality of so many false flag attacks in Syria is quite dizzying. Since this war of aggression by the West was first started in 2011, the U.S. and U.K. have attempted to smear President Assad’s forces with multiple war crimes. However, it’s the predictable false flag chemical attacks that are reserved for much broader strategic purposes. These both fake and real chemical assaults started with the Obama administration and have continued unabated under Trump. And the war planners in the Pentagon show no signs of abandoning this childish duplicity. With the opening ceremonies having been completed today — Thursday, June 14 — and competition having started, the whole world ought to be on HIGH ALERT. The U.S. coalition in Syria has repeatedly proven that it will stop at nothing to turn the tide of events against Assad. The same AAA secret service and intelligence operatives have even shown their proficiency at staging fake chemical attacks, where no one was killed or injured. The MSM is so on board with their fake news that nobody knows any different except those few Alt Media investigative journalists and on-site whistleblowers. Because of what is truly at stake in Syria, the next false flag chemical attack promises to be a HUGE terror attack that is real, not fake. The U.S. coalition knows that it must fraudulently generate a lot of sympathy and support for their engineered war. After all, it is the Greater Israel project that the Neocon Zionists will advance by any means possible. Just like the 9/11 terror attacks were carried out for the very same reasons, the Modern State of Israel has laid bare its intentions to take over the Levant by any means necessary. Action Plan: There’s no better way to stop the upcoming false flag attack in Syria than to pre-empt it with a global alert before it happens. The Alt Media is now big enough that it is able to expeditiously viralize urgent information such as this. Now that Russia has verified this Neocon scheme, we know who they are and what they’re planning. As for the when and where, every Syrian citizen ought to be aware of this false flag so they can help thwart its execution. Social media can be effectively used for this purpose just like the NWO cabal utilizes Facebook to run their color revolutions and Twitter to organize their violent protests. The Anglo-American Axis is represented, first and foremost, by the major English-speaking countries of the world: USA, UK, Canada, Australia, New Zealand and Israel. The European member nations of NATO, such as Germany, France, Italy, Spain, Portugal, Belgium, Luxembourg and the Netherlands are also closely aligned with the AAA as are all the Scandinavian countries. So are the Asian Pacific Rim nations of Japan, South Korea, Taiwan and the Philippines. Saudi Arabia, Turkey, Egypt, Pakistan, Kuwait, Jordan, Bahrain, United Arab Emirates, and Qatar also owe their allegiance to the AAA but some of these may be changing. The World Shadow Government is an ultra-secret, supranational organization which completely controls the Anglo-American Axis, as well as the European Union, NATO, among many other institutional entities which constitute the Global Control Matrix.